The works of John Williams are as ubiquitous as orchestral music can be in our 21st Century pop-dominated, globally diffuse society. It’d be an interesting experiment to see if a random sampling of people on the street would be as successful identifying such classical music standards as Mozart’s Eine kleine Nachtmusik or Tchaikovsky’s 1812 Overture as they would the opening theme to Star Wars. Orchestras across the land take advantage of this, filling concert halls and outdoor amphitheaters with people who’d be unsure about doing the same for Beethoven or Mahler, let alone another living composer such as John Adams or Pierre Boulez. Not surprisingly then, most concerts of Mr. Williams’ music tend to offer a collection of his greatest hits. Brass heavy fanfares and lush neo-romantic string passages stack up on each other like endless layers of a cake: consume too much and you reach a point of sugar overdose, regardless of how delicious each individual piece happens to be. When Mr. Williams makes his annual visits to the Hollywood Bowl to conduct the Los Angeles Philharmonic, he usually avoids this by trying to mix in some lesser-known works of his and other composers; but he also knows that the light-saber-wielding crowd is there to hear E.T., Raiders of the Lost Ark, Jurassic Park, and other favorites and not his cues to the second reel of Goodbye, Mr. Chips or other such trifles. That’s not a bad thing, mind you, but it can get predictable and is not exactly “special occasion” fare. 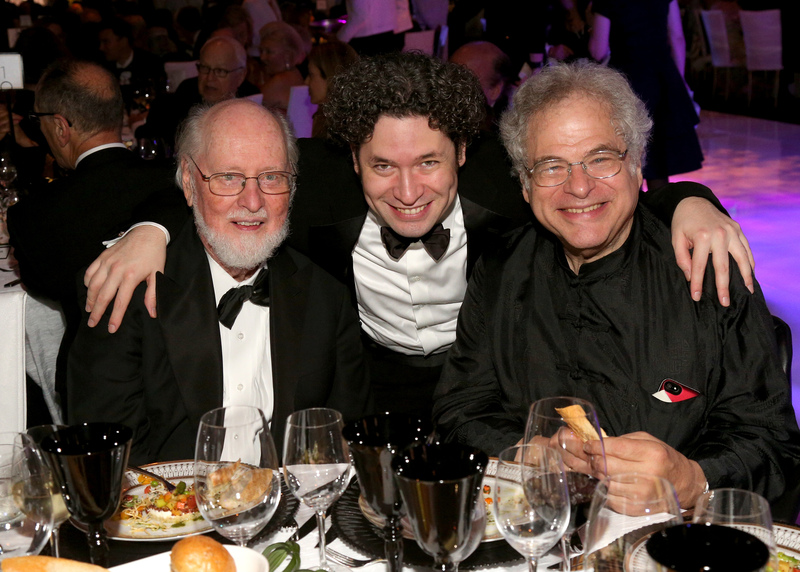 So it is with no small amount of curatorial wisdom that when Gustavo Dudamel and the Los Angeles Philharmonic decided to honor the composer for their 2014-15 season opening gala, they chose a program of that showed off his considerable stylistic range by mixing some popular highlights with infrequently heard gems. Equally notable on this night was that unlike John Williams concerts at the Hollywood Bowl, the LA Phil played the music without commentary just as they would a typical subscription concert, thereby adding an extra whiff of formality to the event. The concert started with two works that deal directly with the composer’s adopted hometown of Los Angeles and his relationship with the LA Phil. The first was a full-throated rendition of his Olympic Fanfare and Theme, written for the 1984 Summer Games in Los Angeles and given its world premiere at the Hollywood Bowl the day before the opening ceremonies at the Coliseum. It was radiant. Two batteries of U.S. Army Herald Trumpets, flanking the stage from the first rows of the Orchestra East and West sections, added to the sense of occasion. Immediately following was Soundings, the only work on the program written specifically for the concert hall — in fact, written specifically for Walt Disney Concert Hall on the occasion of its grand opening in 2003. It is a complex, layered work stemming from a question the composer asked of himself: what would the hall sound like if it was played like an instrument (bowed, plucked, banged, etc.)? It builds from seeming disorder over five sections to a grand theme, reminiscent in style and structure of the composer’s Suite from Close Encounters of the Third Kind. It was good to have it played again in the performance space that inspired it and deserves additional hearings. 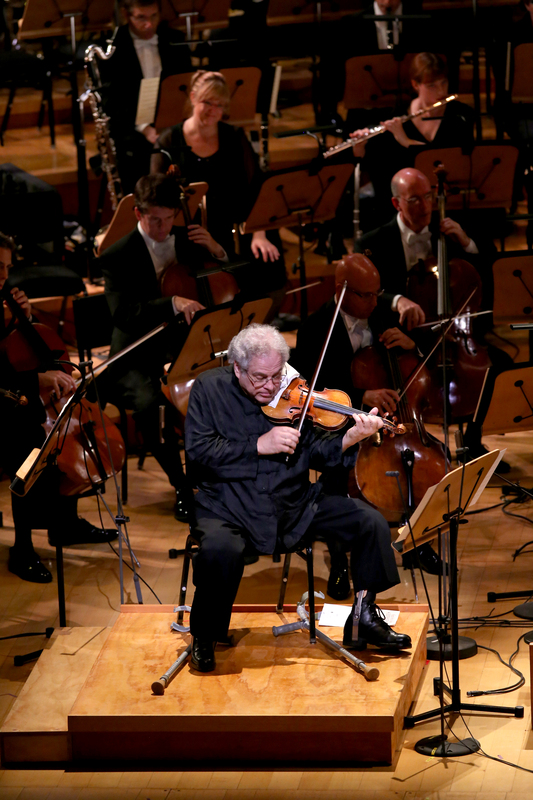 Gala concerts usually require a big-name soloist, and on this night, Itzhak Perlman ably filled the role. Mr. Williams wrote the violin solos in Schindler’s List expressly for him, and Mr. Perlman played three excerpts from the film score with the depth and passion usually given to the likes of Brahms, without ever allowing it to sound maudlin. 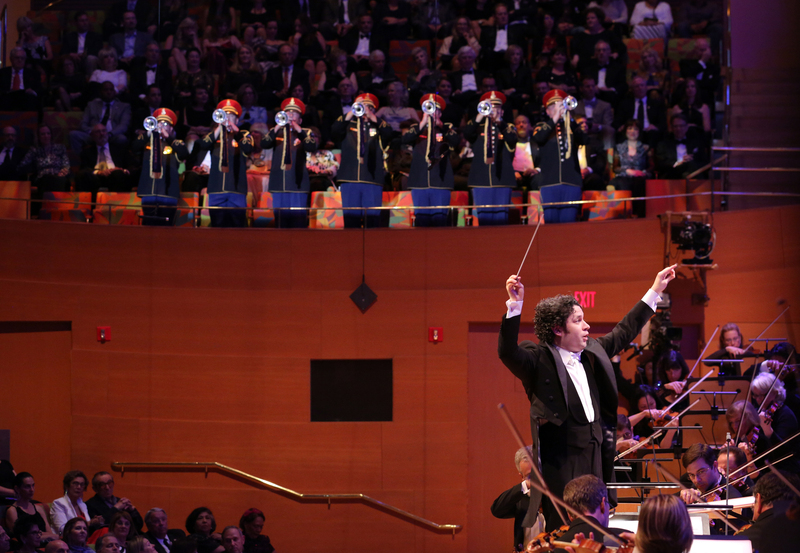 Mr. Dudamel and the LA Phil supported him with appropriate reverence. Afterwards, Mr. Perlman et al offered a distinct change of pace with music from Fiddler on the Roof, the first movie score that earned an Academy Award for the composer. It gave the soloist a chance to show off his still-considerable technical chops, with the LA Phil’s clarinets (Michele Zukovsky and Andrew Lowy) playing some juicy opening lines to set up the fireworks from Mr. Perlman. The subsequent standing ovation was loud and immediate. The Duel from The Adventures of Tintin displayed the composer’s skill in writing an old-school swashbuckling sequence, accompanied by an entertaining video montage showing sword play scenes from movies and cartoons old and new and ending, appropriately enough, with the Raiders of the Lost Ark scene when Indiana Jones famously shoots a swordsman instead of engaging him with his whip. The most fascinating music of the evening were the three Escapades from Catch Me If You Can. Unlike all the brash and lush music that preceded it, this score was bluesy and soulful. Dan Higgins (alto saxophone), Glenn Paulson (double bass), and Michael Valerio (vibraphone) added virtuoso solos loaded with poignancy and authentic film noir angst (even if the movie itself is not of that genre). I couldn’t help but compare it to City Noir by John Adams, a work premiered at the 2009 LA Phil gala that Mr. Adams says “may also be experienced as the soundtrack to an imagined noir film.” City Noir is a very fine work of art refracting a film noir score, but the score from Catch Me If You Can was equally compelling (the soloists perhaps more so) and, despite the lack of concert hall credentials, had its own musical complexities to be enjoyed. Mr. Dudamel said some words thanking and honoring Mr. Williams and his decades-long association with the orchestra, then led the orchestra in a rousing rendition of some of the composer’s most iconic music, the “Throne Room and Finale” from Star Wars, to the delight of all — and really, who doesn’t want to hear the music of Star Wars played in its unabashed glory within the stellar acoustics of Walt Disney Concert Hall?!! That was the end of the official program, but there were numerous encores to be played, of course. The Los Angeles Children’s Choir walked down the aisles and onto the stage singing “Dry Your Tears, Afrika” from Amistad as the women of the Los Angeles Master Chorale joined in from their usual spots in the choir loft. In a clever bit of stage direction, the children were then scared off by the ominous strains of the theme music from Jaws. 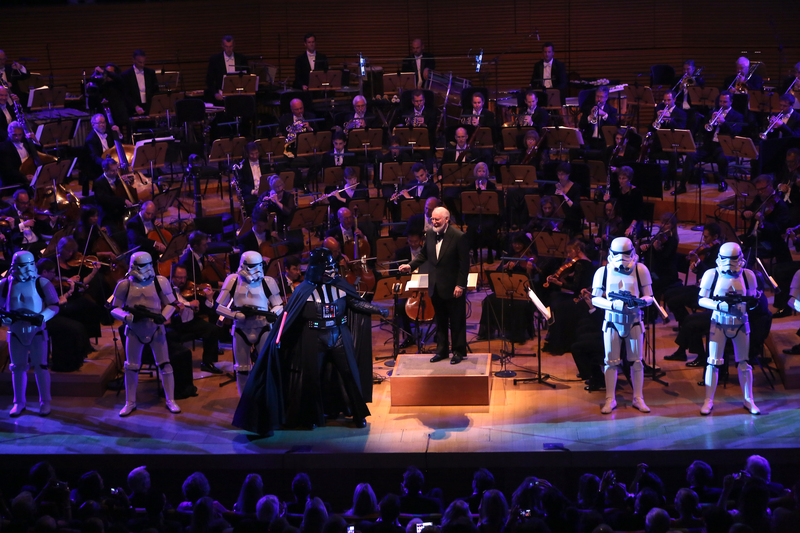 This cleared the way for the composer himself to take the podium to conduct the “Imperial March (Darth Vader’s Theme),” joined by a squad of stormtroopers led by Darth Vader himself. The requisite end-of-concert confetti, this time shaped in the outline of R2D2 and C3PO, rained down on the joyous crowd as they gave their final standing ovation of the evening. The more well-heeled patrons filed off to attend the post-concert dinner and dancing under a tent on the closed-off Grand Avenue, while others made their way to their cars. Regardless of their final destination, everyone had broad smiles on their faces after getting the rare treat to hear this music played by this fine an orchestra in this spectacular venue. Playing third horn for this concert was Dale Clevenger, Principal Horn Emeritus of the Chicago Symphony Orchestra. Really. Numerous video cameras were on hand to capture the evening, and the concert will be broadcast in the future (exact date still TBD). Speaking of video, Netia Jones — she of last year’s gala and the previous LA Phil presentation of Oliver Knussen’s Where the Wild Things Are — was credited with “projection design” for the evening. This was limited primarily to two of the works on the programs: Soundings, where title slides were mixed with outlines of WDCH, abstracted footage of the 2003 gala and what I assume was the original performance of the work, and animated birds flying by; for the Throne Room and Finale from Star Wars, she displayed concept art from the Lucas Museum of Narrative Art’s Star Wars Archive. It was pleasant enough, but I’m not sure it added anything to the concert experience. The Throne Room and Finale from Star Wars has actually been recorded by the LA Phil under the baton of Zubin Mehta for London/Decca; however, the program made no mention of it. Among the concertgoers was the usual mix of politicians (Los Angeles Mayor Eric Garcetti, arts patron and outgoing LA County Supervisor, Zev Yaroslavsky, et al), musical luminaries (LA Opera Music Director James Conlon, legendary USC Thornton School and Colburn School clarinet pedagogue Yehuda Gilad, among others), LA Phil Board members and executives, and assorted celebrities. The later category included the likes of Julie Andrews, William Shatner, and Anjelica Huston, all regular attendees of past LA Phil galas. Most noteworthy for me was Stana Katic, actress and star of the TV show Castle, not only because she looked stunning in a traffic-stopping backless black dress, but also because she happened to be walking right in front of me in that dress. Before I saw Ms. Katic, I had briefly considered walking the white carpet (yes white, not red) and braving the throngs of paparazzi just for grins, but there was absolutely no way I was going to be the person to follow that display of Hollywood glamour. Tags: Dale Clevenger, Dan Higgins, Glenn Paulson, Gustavo Dudamel, Itzhak Perlman, John Williams, longreads, Michael Valerio, Stana Katic, Star Wars. Bookmark the permalink. Since you have mentioned John Adams several times in this report, i think it would be appropriate to mention that he was in the audience that evening. I saw pictures of him there, but I didn’t spy him myself. Not much can beat a Shatner sighting, though. Second year in a row I’ve seen him at the gala, but have never seen him at a subscription concert. I think Gustavo should program Oedipus Rex and hire Shatner to be the narrator.